Former local and talented artist Mason Edwards has produced another cracking railway poster. 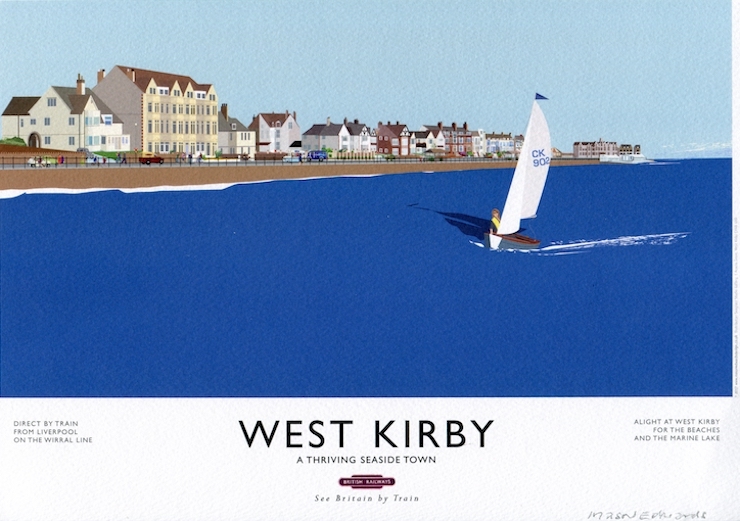 This one obviously features West Kirby and the Marine Lake. And to the far right the now-gone Hydro Hotel. In fact, the left-most building has been recently demolished too (apartments coming soon)! You can purchase the above print and others in the series by Mason at Seagrass Studio in the centre of West Kirby. A super picture. Close to the Hydro Hotel (formerly the Hoylake Hotel) you can see the old West Kirby open air pool which was basically a roped off area of the lake. My mum used to speak very fondly of childhood days spent there. I only remember going there once and sadly Hoylake UDC closed it in the 1960s or perhaps very early 70s due to poor water quality. Not poor water quality – if this was the case then all aquatic pursuits on the lake would be banned. The progressive and forward thinking HUDC of 1899 built the lake and opened the swimming pool – HUDC closed it in the 70s without replacement, concerns or consequences!. Where have all the open air swimming pools in the Wirral gone? Our peninsula is surrounded by water – every child (person) should be able to swim and be taught water safety – without outdoor seawater pools this is difficult. Shame! I absolutely agree it is a tragedy that our other fabulous outdoor pools in Hoylake, New Brighton and Wallasey were closed. Indoor swimming is a totally different experience and ok for exercise if there are enough lanes but indoor pools are not places for relaxation and socialising. The whiff of chlorine and air conditioned air or real weather and fresh air? There should be a choice. The reason given at the time for the West Kirby closure was indeed poor water quality due to sewage contamination. This was of course in the days of many local raw sewage outlets and Cadet dinghies and prior to the lake being used for sailboards, etc. with the increased chance of swallowing water. For those of us who live abroad, how do we get a copy of this beautiful poster? As an old West Kirby-ite, I’d love to see this framed and in my living room in the seaside town of Wilmington, North Carolina. This really evokes the classic railway poster style. Scope for a series where the posters link together as a panorama – although each one can stand alone – in the style of Tom Purvis’s wonderful “East Coast Joys”? “Wirral Coast Joys” could perhaps be sailing, walking, golfing, cycling, sand yachting, birdwatching. Very illustrious company, but I am not in that league I am afraid! Kirby Station, Hoylake Station, and Royal Liverpool Golf.Club. Now I am semi retired I can.gradually work my way round the sights of Hoylake and West Kirby. I remember sailing in your cadet in (I think) 1959. At the time I had a little “teach yourself to sail” book, and the cover had a line drawing of a sailing dinghy. I’ve still got the book somewhere, and it has the number of your cadet, 2010, drawn in on the sail. Fifty-eight years on, I still have a sailing boat at West Kirby, and am still learning…. Hi Chris it could all have been my cadet. I do remember you from your time at Calday. Didn’t you live in a house facing on to the school playing g fields? I stored my boat in the yard of the old station at Kirby Park. Where the Temples stored their coal,? Good to hear from you and pleased you like the picture. Not sure you know but I have also done images of Hoylake and West Kirby station.